Embrace the self-sufficiency of an “off grid” lifestyle and experience a simple life, at a slower pace. Feel rejuvenated by escaping reality … just for a while. Deep Blue Haven has elevated and sheltered panoramic views overlooking pristine Whangaparapara Harbour, native forest hills, and valleys, across to the historic whaling station, then out to sea. The comfortable three-story home is an exposed rafter and timber dwelling with a unique warm and homely character and furnishings that capture the homestead and nautical rustic charm. The top story and main bedroom has two double beds. The floor area is expansive and setup as an artists studio to enjoy the palatial views for relaxation and inspiration. Lie in bed and admire the International Dark Sky Sanctuary clear night skies through the skylights or get professional stare gazing advice from the star watching section of the monthly barrier bulletin. The second story has one queen bedroom and main bathroom. The large kitchen and living space features an old fashioned bar setting for entertaining. There’s an authentic old English wood burning stove and cast iron cookware, but also modern kitchen with gas stove and large wok. There are large elevated decks and barbeque area for Alfresco dining. Early breakfast on the balcony will ensure stunning views as the sun reaches down the valley, feel alive being surrounded by nature. The lower story has a spiral staircase with two queen bedrooms and is refreshingly cool to sleep in summer. We have good Vodafone mobile coverage for Hot-spotting, internet and free-view television. Free WiFi up to 4 GByte via iPad Hot-spot. High quality beds with mosquito nets, window and door insect screens. The property has formed steps that wind down through the garden and native bush to the harbour waters edge. It’s then five minutes walk along the road to Great Barrier Lodge with casual Restaurant dining and Bar till late. Walk on further to the sheltered harbour, floating jetty and boat ramp. Enjoy sailing, snorkeling, spear fishing and scuba diving. Hooked on Barrier Charter sight seeing and fishing trips leave from the wharf. Hire a kayak. Standup paddle boarding in the early morning is very popular. Walk 15 minutes around the rocks and cast your line in. Deep Blue Haven is conveniently located less than 20 minutes from Claris Village. Perfectly positioned right on the edge of the Aotea Conservation Park this lovely accommodation option is minutes from numerous hiking trails, day walks and New Zealands "other" Great Walk - The Aotea Track. The historic whaling station and saw mill remains, waterfalls and natural hot springs are all within reach for those keen to hit the trails. Would you like to spend some time on the water? Shiny Paua Paddle Boards is just along the road and Sundancer Coastal Cruises and boat fishing trips departs from the local Whangaparapara Wharf. You'll be able to stroll along to Great Barrier Lodge for lunch and/or dinner & refreshments too ! Would you like to spend some time on the water? Shiny Paua Paddle Boards is just along the road and Sundancer Coastal Cruises depart from the local Whangaparapara Wharf. I'm Filipino and have lived in New Zealand for 32 years. 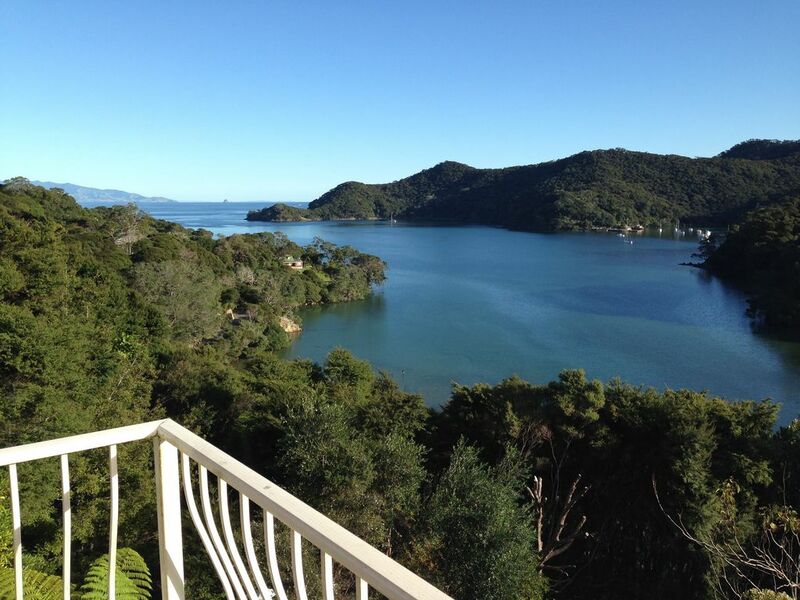 My husband and I love our semi-retired life style on beautiful and peaceful Great Barrier Island. We are busy and help out in our very small community. We really enjoy sharing our summer paradise with Bookabach travelers. We meet lots of really friendly people. We raised our family in Auckland but now have the opportunity to live an off-grid lifestyle, enjoying simple pleasures like gardening, fishing, gathering firewood and cooking on a wood stove... its great. We are lucky, and grateful, to be living our dreams. Basic - if you want something just ask. Turn on the left hand poweroutlets. Television should come on with freeview. Dont turn off the decoder or television with the remotes. The third remote is for the DVD player.